Received your letter of Oct. 31 just before I left for Paris to attend a school and when I returned your letter of Nov. 14 was here. Thank you very much for your encouragement and kind thoughts and the news of my family. The little news of their well-being and happiness is what really keeps me going. The happiest occasion for a long time came yesterday with the surprise visit of Delegate Joe Farrington. It was really a thrill for the boys from Hawaii – especially for the veterans of the 100th -to hear him and grasp his hand. He gave us a brief talk on what is going on in Hawaii and the mainland – emphasizing particulars which drew our interest. He gave us assurance of the thoughts and prayers of the people of Hawaii for the men overseas – just the jolt we needed after what the men went thru. I was seated next to him for coffee and heard of the good work of the E.S.C. and he also mentioned you and Mr. Turner. We also had the privilege of offering him the honorary membership of the Club and he proudly accepted it before the men. He shook hands with many and even carried messages for us to the people of Hawaii, We told him the place where Maj. Jack Johnson is resting and I know he will make every effort to visit it. Of interest to you, and I know you may have had the news, is the promotion of Lt. Bob Taira. He got it about two weeks ago. Kenneth Mitsunaga is still around carrying on. The news of Baron Goto is really the core of patriotism of a real American. If anyone deserved the privilege of American citizenship, it is Baron. I’m rejoicing in the news with you and many of his friends. I see Joe Itagaki often – in fact took him on our jeep. He is loved by all and I believe he is one of the oldest men of this outfit. You remember Earl Kubo – once with the Police Dept. He is the sergeant major of the regiment and very able at his job. There are many other U. H. boys and you can be very proud of them. On my way back from Paris, I visited the hospital – received more encouragement from the wounded to carry on. It Is a funny way to express a visit to a hospital but one cannot help but admire these boys – some badly wounded. They are great kids and the longer you stay with them the more you think of them. Capt. Takahashi will be going back, as when I saw him, he just had news so rode back with me to pick up his things. It’s good to see him go back as I seen plenty and has most ably done his share. 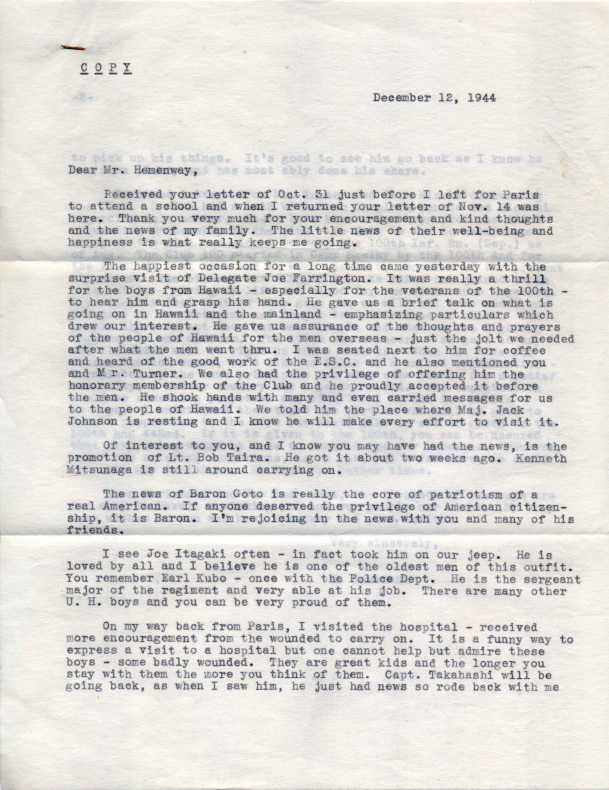 Received letters from Mr. Turner and Jack Mizuha discussing the Club. I also had a talk with both Chaplain Yamada and Higuchi this matter. There have been a few boys from the 442nd requesting membership to the club – in fact we had to return some as the club was closed to only the 100th Inf. Bn. (Sep.) as of Aug. 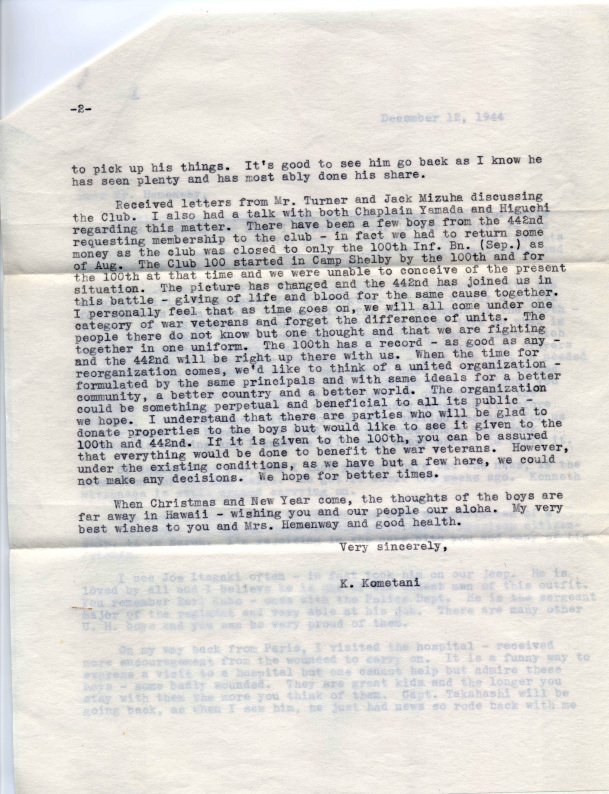 The Club 100 started in Camp Shelby by the 100th and for that time and we were unable to conceive of the situation. The picture has changed and the 442nd has joined us in this battle – giving of life and blood for the same cause together. I personally feel that as time goes on, we will all come under one category of war veterans and forget the difference of units. The people there do not know but one thought and that we are fighting together in one uniform. The 100th has a record – as good as any – and the 442nd will be right up there with us. When the time for reorganization comes we’d like to think of a united organization – formulated by the same principals and with same ideals for a better community, a better country and a better world. The organization could be something perpetual and beneficial to all its public -we hope. I understand that there are parties who will be glad to donate properties to the boys but would like to see it given to the 100th and 442nd. If it is given to the 100th, you can be assured that everything would be done to benefit the war veterans under the existing conditions, as we have but a few here, we could not make any decisions. We hope for better times. When Christmas and New Year come, the thoughts of the boys far away in Hawaii – wishing you and our people our aloha. My very best wishes to you and Mrs. Hemenway and good health.